The liability protection of the component parts doctrine is inapplicable to suppliers of materials used in a foundry’s manufacturing process where the products supplied were not incorporated into a different finished or end product but, instead, allegedly caused injury when used as intended, the Supreme Court of California has ruled in affirming a California Court of Appeal’s ruling. Thus, the court remanded the case to the trial court for further proceedings (Ramos v. Brenntag Specialties, Inc., June 23, 2016, Cantil-Sakauye, T.). A metal foundry worker, who worked for Supreme Castings & Pattern Co., Inc., alleged he developed interstitial pulmonary fibrosis as the result of his exposure to fumes from molten metal and dust from plaster, sand, limestone and marble used to create molds for the casting process. He brought claims for, inter alia, negligence, negligence per se, and strict liability against various metal and mold material suppliers. Lower courts’ rulings. The trial court granted judgment on the pleadings to the suppliers, and after the worker filed his fourth amended complaint, the court granted the suppliers’ demurrers and entered joint judgment of dismissal on the ground that the component parts doctrine relieved the suppliers from liability. On appeal, the court found that the worker sufficiently stated viable strict liability and negligence claims based on defective design and defective warning, and that the component parts doctrine did not immunize the suppliers from liability (see Products Liability Law Daily’s March 24, 2014 analysis). The California Supreme Court granted review to resolve a direct conflict between the appellate court’s decision and Maxton v. Western States Metals, 203 Cal.App.4th 81 (2012), upon which the trial court had relied in sustaining the suppliers’ demurrers. Component parts doctrine. In light of the scope and rationale of the component parts doctrine as set forth in prior California decisions and section 5 of the Restatement Third of Torts, Products Liability, the court found that the appellate court correctly determined that, contrary to the decision in Maxton, the component parts doctrine is not applicable to the factual setting alleged in this case. The worker’s injury was not caused by a finished product into which the materials supplied by the defendants had been transformed and integrated. Instead, the injury as alleged was caused directly by the materials themselves when used in a manner intended by the suppliers. According to the allegations of the complaint, the suppliers did not have to guess or speculate about the type of use to which their materials would be put, but rather they were aware of and intended that the materials they supplied would be used in the manner in which the materials were actually used. The component parts doctrine (and the protection if affords to suppliers) is not addressed to such circumstances, according to the court. As such, the appellate court properly determined that the trial court erred in sustaining the suppliers’ demurrers to the fourth amended complaint in reliance on Maxton. 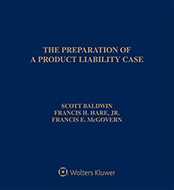 In addition to disapproving of the decision in Maxton, the court emphasized the limited scope of its decision, which did not address the applicability or scope of other products liability doctrines that may be implicated. The legal issues and factual questions regarding the strict liability and duty-to-warn claims remain to be resolved. The case is No. S218176. Attorneys: Raphael Metzger (Metzger Law Group) for Flavio Ramos. Robert Kum (Sedgwick LLP) for Brenntag Specialties, Inc. and Brenntag North America, Inc. Eugene Charles Blackard, Jr. (Archer Norris, PLC) and George E. Nowotny (Lewis Brisbois Bisgaard & Smith LLP) for Valley Forge Insurance Co.
Companies: Brenntag Specialties, Inc.; Brenntag North America, Inc.; Valley Forge Insurance Co.